Some 18 residents of the coastal community of Brighton have signed a petition calling on the Government to stop sand mining at the Brighton Beach. 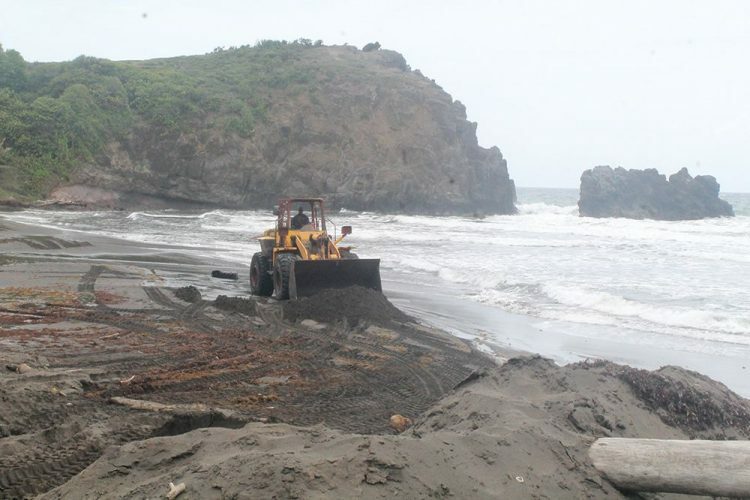 âWe call on the government to stop mining sand at Brighton right now, to fix our roads and to address our several other individual and collective issuesâ¦,â the petition, sent to the Editor of SEARCHLIGHT and dated May 31, 2017 said. The signees state that they have chosen to associate themselves with an article written by veteran lawyer Theodore Browne and published in SEARCHLIGHT on April 28, 2017, which outlined the impact sand mining has had on the Brighton Beach. The petition further states: âOur little paradise has been destroyed. The value of property is falling. The sea is encroaching on our homes and we face the risk that one day they can be washed away. The access road to our homes was badly damaged by trucks and heavy equipment involved in sand mining. BRAGSA also dug up a part of the road but never fixed it. This is one of our biggest problems. The matter was made worse when someone from the government told us that fixing our road which the government and BRAGSA helped to destroy was not âa priorityâ. âWe have seen the devastation of sand mining first hand. No one had to tell us about it. We invite the public to come out and see how Brighton has been ruined by sand mining. We canât believe that this is happening when we ae hearing so much about climate change and rising sea levels,â the petition said. The residents stated that there should be greater respect for their rights as citizens of the country. The Brighton Beach is located at the southernmost tip of mainland St Vincent.